I think that it was Marco Kalnenek, who introduced me to Mike James around 1991, but I am not sure. Anyway, within a few weeks I had received from him a few dozens of cassette tapes, with all kind of interesting material: rare and unknown LP’s, radio shows, television documentaries and last but not least Mike James himself rambling about everything that was of his interest. There was little to none information on the tapes, which I learned to appreciate over the years. I prefer detailed liner notes with every track, but it paid off to lower my audio gourmet standards. Of all the people I trade with, Mike James is one of the most generous. After having received all those tapes, I made a compilation cassette with excerpts from Mike James’ audio letters. 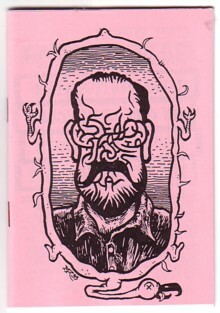 I also made a little fanzine with some extra information about this phenomenon and asked Marcel Ruijters to draw an illustration for the cover. The flood of tapes did not stop, and I should have made more compilations to do the man justice. As an audio illustration I picked a part from the compilation tape, which should not be considered as representative for the rest of the tape.